Are women more likely to buy gold coins or stylish shoes? Which does one see more frequently in a ditch: an anchor or a bicycle? 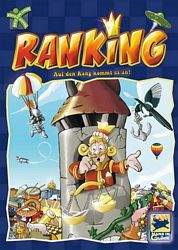 In RANKING, players are required to answer such questions. In addition, all players work together to place a group of items in order of rank. In this process, each player tries to secretly or brazenly move his own item upward in rank. Thus, by bluff, good reason, and small lies players move their items upward and their opponents’ items downward in rank. Naturally, a player who proceeds too obviously, falls straight to the bottom!